If you missed January’s Empire State Producers Expo, you can peruse the conference proceedings now available online at www.hort.cornell.edu/expo. You’ll find summaries of nearly 100 sessions on everything from alliums to vine crops, including many resources on the emerging pest, Spotted wing drosophila. Via Liz Falk efalk@cornell.edu, Professional Development Educator, crossposted from the Cornell Garden-Based Learning blog. For the second year, we will be planting the Vegetable Variety Demo Garden (VVdG) again here on the Cornell campus and would like to collaborate with CCE offices New York statewide to install a VVdG in your county. 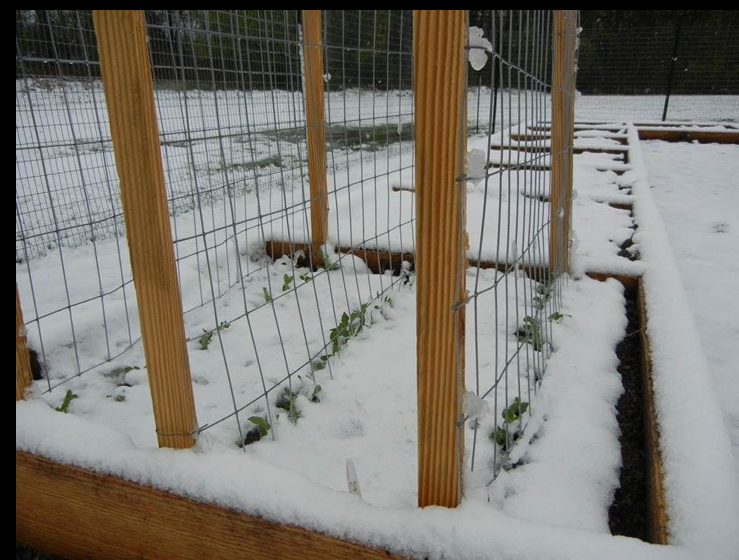 Some of the same elements from 2012 will be repeated including vegetable varieties and components of ecological gardening (cover crops, companion planting, and mulching). 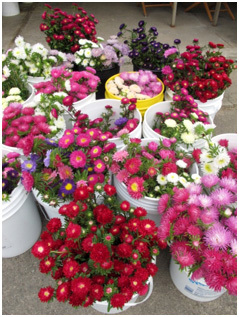 This year we will also be adding perennial plants to the garden, a compost bin and – in keeping with the 2013 Horticulture theme – multiple types of plants for attracting beneficial insects. As always with VVT, we will encourage others to rate varieties by using the website at http://vegvariety.cce.cornell.edu. Wearing a hat befitting the title, Sir Martin of the Cluster Primordia cuts the ceremonial cake. 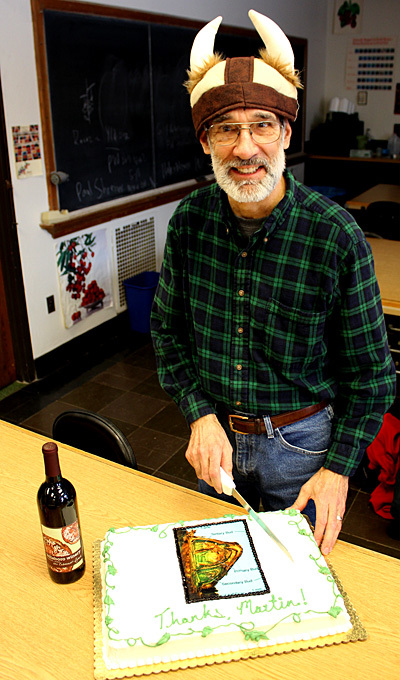 Alan Lakso, Justine Vanden Heuvel, students in HORT/VIEN 4444 and others feted retired Senior Extension Associate Martin Goffinet on the occasion of his last teaching assignment. 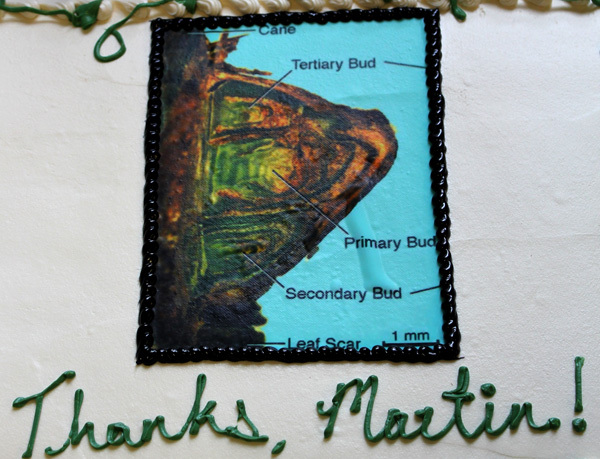 While widely recognized for his research and Extension efforts, Goffinet has generously shared his expertise in grapevine structure, anatomy and growth with students over the years. Let it be known throughout the Kingdom of Horticulture, on this 27th day of February, in the Year of our Lord 2013, that Martin Goffinet is recognized for serving his King and Queen valiantly, with years of volunteer service above and beyond his ordained retirement date, and well in excess of what mere mortals usually give in service to the Kingdom. Therefore, let it be known, from this day forward, that Martin Goffinet – despite his French-sounding name – will be heretofore known as Sir Martin of the Cluster Primordia – a title befitting only the most esteemed anatomists and knights. Please accept our sincerest gratitude for a job well done, and may Pomona, Dionysus and Bacchus shower you with many blessings for as long as you choose to sit with the other Knights of the Round Table Grape. Goffinet’s ceremonial cake featured a frosting version of one of his classic grapevine anatomy images. The Second Annual Northern Grapes Symposium featured first-year results from viticulture, enology, and economics/marketing studies that are part of the USDA-funded Northern Grapes Project, which began in October 2011. Approximately 120 people attended three sessions of the Symposium, held on February 6, 2013 in Rochester, NY, in conjunction with the Viticulture 2013 Conference. View PowerPoint slides from the presentations. The Northern Grapes Project is a multi-institutional Coordinated Agricultural Project funded by the USDA’s Specialty Crops Research Initiative, with a multidisciplinary team from 12 universities in collaboration with winery and grape grower associations in ND, SD, MN, NE, IA, WI, IL, NY, VT, CT, and MA. It focuses on production, processing, and marketing of new cold-climate wine grape cultivars that have spawned new wineries and vineyards in the upper Midwest and Northeast. http://northerngrapesproject.org. The project also sponsors webinars, generally on the second Tuesday of each month. More webinar info. Poor children’s higher weights linked to less access to yards, parks [Cornell Chronicle 2/20/2013] – Low-income children may be overweight in part because they have less access to open green space where they can play and exercise, reports a Cornell study of obesity in Europe. “It is important to take an ecological perspective in thinking about the challenge of childhood obesity. The environment, personality, culture, stress, family history and economics likely all play an important role,” said lead author Gary Evans, the Elizabeth Lee Vincent Professor of Human Ecology in the Departments of Design and Environmental Analysis and of Human Development in Cornell’s College of Human Ecology. Endowed NYSAES directorship paves way for agricultural innovation [Cornell Chronicle 2/13/2013] – In 2009, Businessman Larry Goichman ’66 and his wife, Jennifer, endowed the first professorship of enology and viticulture at the New York State Agricultural Experiment Station (NYSAES) in Geneva. Now the Goichmans have increased their commitment to the endowment and the Geneva station, enabling a Goichman Family Directorship of the New York State Agricultural Experiment Station. Imaging Facility adds two tools for microscopy [Cornell Chronicle 2/13/2013] – Cornell’s Imaging Facility, located in Weill Hall and in the College of Veterinary Medicine, has added a spinning disk confocal microscope that enables users to image and manipulate fluorescent specimens rapidly, and an instrument for laser capture microdissection, which allows researchers to isolate specific cells or tissues from a sample by slicing out particular regions with a laser. More than maple: tapping the potential of walnut and birch [Cornell Chronicle 2/12/2013] – Thanks in part to the efforts of the Cornell Maple Program, maple producers are exploring the untapped potential of walnut and birch trees, which produce sap can be boiled down into syrup. Nature lovers invited to train as natural area mentors [Cornell Chronicle 2/12/2013] – Love spending time in the natural areas of the Finger Lakes region? Care about preserving the integrity of the natural world? 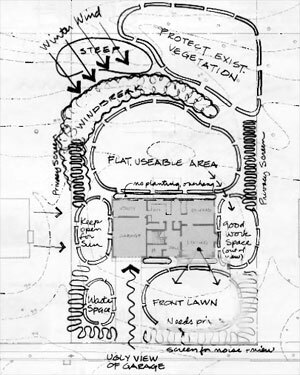 Consider joining Cornell Plantations’ Natural Areas Academy (NAA). The year-long academy features dozens of expert-led workshops, field trips and directed stewardship opportunities designed to provide participants with the knowledge, tools and skills needed to support efforts in preserving natural resources. March 25 to May 9, 2013. 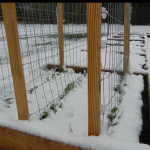 Add-on tests for landscape, urban and high tunnel situations, including soluble salt, heavy metal and hot water soluble boron tests. Low-cost individual tests for potentially mineralizable nitrogen, soil texture, wet aggregate stability, available water capacity, active carbon, and bean root bioassay. A field penetrometer available for loan. Visit the lab’s webpage for more information, or contact contact Bob Schindelbeck, (607) 227-6055,rrs3@cornell.edu. 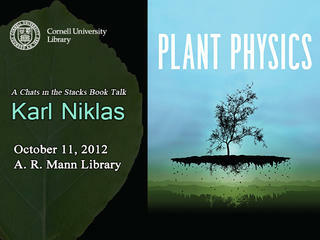 Last fall, Karl Niklas, the Liberty Hyde Bailey Professor of Plant Biology, gave a talk about Plant Physics, a book he co-authored with Hanns-Christof Spatz, professor emeritus of biophysics in the Faculty of Biology at the Albert-Ludwigs-Universität Freiburg in Germany. If you missed the talk, part of Mann Library’s ‘Chats in the Stacks’ series, it’s now available online. The book explains how plants cannot be fully understood without grasping how physical forces and processes influence growth, development, reproduction, evolution, and the environment. Abby Seaman presents Steve McKay with an Excellence in IPM award. by Mary Woodsen, NYSIPM program. Three days after Tropical Storm Lee blew through the Northeast in early September 2011, turning streams into rivers, then lakes, getting a tractor into the waterlogged research plots at Cornell University’s Thompson Research Farm was an obvious no-go. So farm manager Steve McKay slipped on a backpack sprayer and slogged through the muddy fields bordering Fall Creek. McKay was helping test a new “decision support system,” which predicts if or when growers need to spray to protect crops from late blight, a deadly plant diseases. McKay’s team supports research to help growers use softer fungicides and only as a last resort—a principle that’s key to IPM, or integrated pest management. And the next day—a Saturday—he was back again in the cab of a backhoe, digging temporary drainage ditches to salvage what he could of the experiment. Now for his dedication, expertise, and leadership, McKay has earned an Excellence in IPM Award from the New York State Integrated Pest Management Program, which seeks least-toxic solutions to pest problems, including plant diseases. 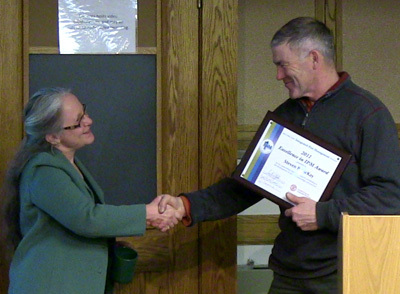 McKay receives his award on February 11 at Cornell’s Horticulture Seminar Series. 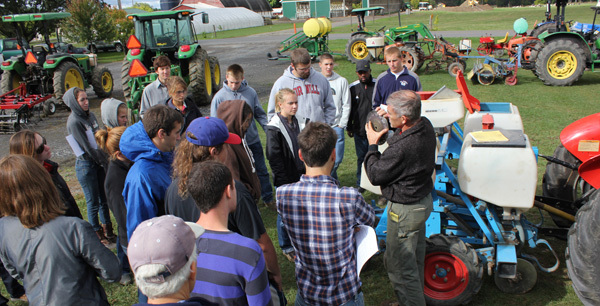 McKay teaches vegetable production class about the inner workings of a planter.